Maison Blanche has its own private entrance & parking area alongside the gîte. A private lawned garden with BBQ, dining and relaxing areas either in the sun or shaded by the verdant vines and wisteria on your own private terrace from where you can enjoy superb views of the valley and distant mountains. Large studio type accommodation with modern stylish & comfortable furnishings, the kitchenette is well equipped with hob/oven,microwave,fridge, coffee maker & ironing facilities but if there is anything you need please ask. Single bed/cot/high chair, if required. Maison Blanche is in a peaceful location with stunning views but only 2kms away from Vernet la Varenne with a bar and restaurant, small supermarket, bakery, butchers, Pharmacy and medical centre. There is a popular swimming lake with it’s own bar/ restaurant open in summer only 1.5 kms away. The area is ideal if you love walking and discovering the local wildlife, especially in April when the pastures are full of wild daffodils and in May with all the colourful wild flowers and butterflies in the fields and hedgerows. You will find booklets of local routes and organised walks in the gîte along with information on other outdoor activities such as bike hire, pony trekking. The town of Issoire is only 17 kms away and has a great weekly Saturday market in it’s medieval centre as well as many individual speciality shops and restaurants along it’s narrow old streets. Mall just off the A75 If you need to shop before you arrive. It’s superb location, outstanding views, peace & quiet. Quality white towels Bath sheet + bath towel + hand towel & flannel provided for each guest and changed weekly or on request. Maison Blanche is the perfect gite from which to explore all parts of the Auvergne. We couldn't have wished for a warmer,more friendly welcome from Lynne, and a more beautiful home for our holiday. The gite is clean, very comfortable & tastefully furnished. And the terrace is perfect for eating & relaxing. The surrounding views look out over the beautiful pastures,woods & hills, which are full of birds,butterflies & wildflowers. It was our first visit to the Auvergne & is now our favourite region of France. It felt like stepping back in time. Highlights were swimming in Lac Chambon with snow still on the peaks in the distance; driving over the mountain roads around Puy de Sancy; eating crepes In Mont Dore; market day in Issoire, & relaxing by our local lake in Vernay. We would definitely return & fully recommend it to anyone. Thank you Sally & Paul for your wonderful review. I am so happy you had a great holiday discovering and falling in love with the beauty of the Auvergne .....just as I did 13 years ago ! It has been a pleasure to get to know you and I look forward to seeing you again in the future. The property was very well appointed, clean and tastefully decorated. Equipped with all that was required and in an idyllic location with splendid views. The nearby village (2km) had a small but well stocked supermarket, excellent restaurant, and swimming lake which was very pleasant after a hot day. Lynne was lovely, welcoming and helpful. I have no complaints at all and highly recommend this property. Thank you so much for such a great review, I am so pleased you loved your holiday here at Le mouy vieux. Lovely guests too welcome back anytime ! We were looking for a a break to recharge our batteries and our time here was just the ticket. Our gite was pretty, comfortable and well equipped and the outside space was wonderful with beautiful views of the region. Lynne was a thoughtful and considerate host who looked after us well and her dog, Louie made a great playmate for our dog who regularly went round to call for Louie. The surrounding area was lovely too and we really enjoyed our morning stroll to the Boulangerie and afternoon dip in the lake was a real treat. Thanks for everything Lynne, we feel that we made a friend and we will be returning! It was a pleasure to welcome my lovely guests to Le mouy vieux it makes it all worthwhile to know how much they enjoyed their stay and their walks exploring the local amenities in the surrounding area. I look forward to welcoming back my new friends and "Barney dog" too. Maison Blanche is a delight. Cosy, comfortable and with everything you could possibly need. We arrived later than planned in the dark. Lynne was there to meet and greet us and helped get us quickly settled into Maison Blanche. When we woke after a good sleep in the comfortable bed we could really appreciate the view, the solitude and delight of Le Mouy Vieux. The Auvergne is a wonderful part of France and Lynne's gite is an ideal place for a couple (or couple with dog) to hang out, relax, explore and enjoy the secrets of the hills and valleys either side of Issoire. The gite has everything needed for a comfortable stay with a glorious wood burning stove and an endless supply of oak logs to hand. A good hot shower too! What more could you want? Lynne and brother Malcolm were wonderful hosts and Louis made a good companion for our dog Martha. We thoroughly enjoyed their hospitality. Thank you. We loved it. And had fun. It was my pleasure to welcome such lovely guests along with their adorable pup Martha. Hope you come back one day. We had a very enjoyable week in this very attractive area. The gite fully lived up to expectations as set out in the published details – beautifully furnished, very well equipped and beautiful bed linen. It was spotlessly clean on arrival. We enjoyed Lynne's company (and her brother’s) and two lovely meals which she cooked for us at an economical price. We can thoroughly recommend this property to any future guests. We will definitely return in the future, although it is doubtful whether it will be next year due to other commitments. Thank you so much for such a great review it was a pleasure to welcome you to Le mouy vieux, lovely guests who I hope to see again in the future. Lovely welcome from host Lynne, lovely setting, pleasantly furnished, small but very comfortable. We were welcomed warmly by our host Lynne who lives next door. We were invited for drinks during our stay which was lovely. Lynne was accessible and very helpful and friendly but ensured we had our privacy. The setting is lovely with stunning views. The gite is comfortable, open plan and suitable for a couple as its quite small, nicely furnished and good quality bed and linens. There is a nice sitting out area where you can dine and sunbathe and enjoy the views. We enjoyed our stay very much and enjoyed meeting Lynne and her brother. There is a Michelin starred restaurant in Sarpoil, a short drive away but you need to book well in advance. Lots of medieval villages nearby and good walking country. We would like to return and would recommend to our friends to stay in the other larger gite next door which is larger and also very nicely furnished. It was our pleasure to welcome you to Le mouy vieux we really enjoyed your company and a perfect evening relaxing with you over drinks and nibbles on the terrace, hope you do come back to stay and we can do it all over again ! 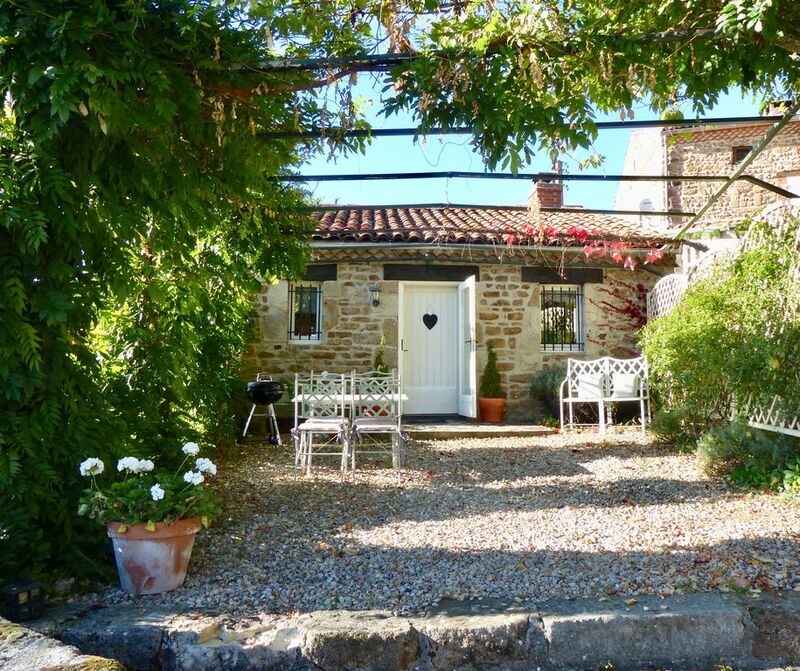 As well as the outstanding scenery from the gîte you can enjoy the view of the magnificent panorama of the chaine de volcans and the puy de dôme from the top of the lane. Vernet la Varenne is only 2kms away there you will find a restaurant and bar, supermarket, bakers, butchers, pharmacy & medical centre and a small weekly market everything you may need on a daily basis. The popular swimming lake 1.5 kms with it’s own café bar open during the summer. Vernet la Varenne many years ago used to be the centre for mining Amethysts in the region and now from Amethyst museum in the Chateau de Montfort perched on the hill above the village you can set off with a local guide on a Amethyst hunt and find your own which you can then clean and polish in the centres workshop. There are many local markets, brocantes, vide greniers, music festivals and fêtes held in the area during the summer. Issoire has a lively evening market and multiple music venues on Friday’s during the summer when the bars and restaurants set up their tables in the street well worth a 20 minute drive down to town to soak up the atmosphere! The abbaye at Chaise dieu a medieval benedictine monastery with it’s ancient ‘ danse macarbe’ mural is also very popular for its renowned international music festival late August every year the town is packed with music lovers and artistes. The town of Puy en Velay set in the crater of an extinct volcano is the setting off point for the pilgrims on the historic route to Santiago de Compostela and it’s amazing church and statue of the black madonna both perched high on top of spinacles of extinct volcanic lava, amazing ! Places of interest to visit within a short drive such as the hilltop medieval villages of Usson and Montperoux.